Here in the states, Poldark isn’t much of a phenomenon yet. It airs as part of PBS’ Masterpiece series, and it’ll kick off its second season this Sunday, September 25, with a two-hour premiere. In England, however, Poldark mania is downright maniacal. The show draws about seven million viewers a week, which is about 15 percent of the entire English population. Some viewers are there to reminisce about the original Poldark series, which ran on the BBC from 1975 to 1977, but others are there for Poldark himself, ably played this time around by Hobbit alum Aidan Turner. On screen, Turner is equal parts smoldering and smothering, struggling to make a go of it as a copper miner in 18th-century Cornwall, England. There’s a love triangle, of course, because that’s how British period dramas operate, but Poldark is more than a bodice ripper. It’s about truth, justice, and Ross Poldark getting his way, and the fans who love the show have come to embrace that mantra wholeheartedly. The A.V. 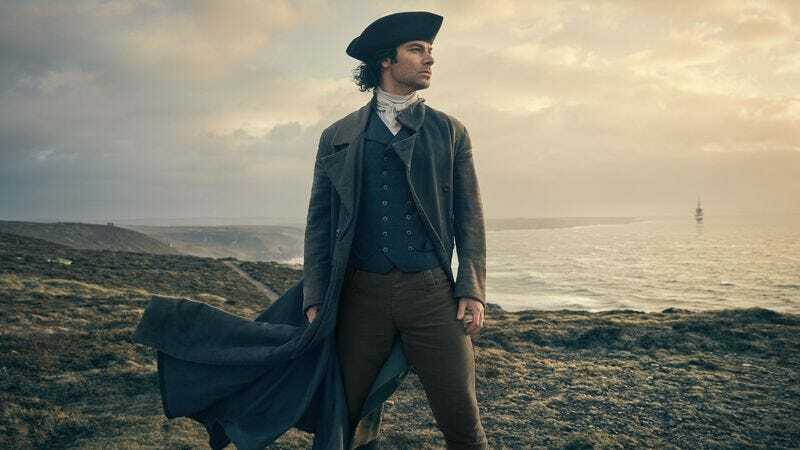 Club talked to Turner about the Poldark phenomenon, Ross’ character flaws, and what fans can expect from Poldark as the show inches closer to its third season, which Turner is filming in Cornwall now. The A.V. Club: Are you surprised by the fervent reaction to the show, especially in the U.K.? Aidan Turner: I think we’re all a little taken aback and surprised by it. You can have a good vibe and a good feeling about something, but you never really know how it’s going to be received and how an audience is going to react to it. It’s lovely when you work so hard on the show, and everyone pulls their weight, and it’s great when you actually get a response like that and people actually watch it. There’s no point in really making something if it doesn’t appeal to a lot of people or the masses or if it’s not seen by a lot of people. There’s a lot of confidence going into [season] two knowing that we’ve established our audience and hit on a demographic that we were looking for. AVC: How is the response in the U.S. different from the U.K.’s? AT: I was at the TCAs a couple of months ago; there seemed like a very positive reaction. From what I could gather, the press was really clued in and had seen our show, which is always a help. It’s always a good sign when they press is engaged, and they haven’t just read the profile a bit and are making a stab at questions. It seemed like they actually knew what was going on. We got a good slot too. We took over Downton Abbey’s slot, I think. PBS is a great network. From what I could gather, people are really liking it across the water. But again, I’m not really 100 percent on ratings or viewership or anything. AVC: Why do you think people are responding to it now? Why do you think this show about 18th-century England resonates in now in the 21st century? AT: It’s hard to know at any stage whether a show is going to work or not. Every few years, a different trend comes along. I was in a show seven or eight years ago called Being Human where I played a vampire. After our first episode came out, I think the same month that Twilight did, everything seemed to be vampires and werewolves and those kind of things. That show became quite popular, and became a little cult hit on a network called BBC3 over here. We just thought we were very lucky that we struck on that while it was the right time. The [Poldark] books are very strong. Winston Graham is a great writer. The books have been around for a long time. The ’70s version of the show was very popular 40 years ago, and I guess those themes are still there. People want to see stories of love and rivalry and friendship. Plus, it’s really well shot, and there are great performances in our show. Debbie Horsfield is doing an incredible job with the adaptation. I just think we’ve got the right pieces of the jigsaw together quite quickly. Sometimes during a show or a film, while you’re shooting it, you’ll think, “This is great, it’s going to be fantastic, the script is incredible, and the actors are great, and everything is working out brilliantly.” And then you see it, and you kind of go, “Oh god, it’s not as good as I thought it was,” and it doesn’t get an audience to watch it. It only does a couple of festivals and then dies and whatever. But people seem to have engaged with our show, which is great. We have a great spot on BBC1 on Sunday night. It’s event television, I suppose. AVC: And people do love a love triangle. There’s always that. AT: It could be that. You can’t beat a love triangle. And Ross is a great guy. He’s an incredible character. He’s not just that typical heroic type of guy. He’s not the Robin Hood who rides in on a horse and saves the day and picks up his pretty wife, puts her on the back of his saddle, and rides into the sunset. There’s more to him; he’s a very flawed character, as much as his moral compass is in the right place. He makes a lot of mistakes, too. He feels quite real to a lot of people. I think men and women alike relate to him, or are affected by him. He’s very three-dimensional. He’s nothing bland about Ross. AVC: He seems pretty upstanding to me, but you’re saying he makes mistakes. What do you see as some of his biggest mistakes? AT: He’s not great at delegating power. He makes no compromises. For instance, we might get a lot more done more effectively if he capitulated to the likes of the people of Cornwall, merchants and the bankers of the world. He would get a lot more done. He’s a great charismatic person, people really like him, but he just won’t bow down. He doesn’t feel that they’re morally good people and that they make good decisions based on the right feelings and purposes. So he takes the burden and the responsibility himself. I guess nowadays you would call a person like that almost a control freak. He is that way. He would do anything for [his wife] Demelza. He wants to provide for her, but through that, he makes some crazy decisions. By the definition of what he does, as a miner and a landowner, down in the mines, it’s a gamble all the time. Ross is a gambler by nature. He’s not just at the card table; he’s down in the mine. You don’t know where that can go. It’s incredibly expensive, and sometimes it can cost a lot of lives. It’s dangerous work. Behind two or three meters of granite, you can have a huge windfall, but you can also have nothing. And people’s lives depend on this, and the whole village depends on this, on challenges and risks that he takes, and decisions that he’s responsible for. Morally, I think his compass is in the right place, but also, he can be a little bit selfish and single-minded, a bit myopic with how he sees things. But that’s why we like him. He’s a flawed character, and he feels like a real person. AVC: And we root for him; we hope he’ll catch a break some day. He’s had a tough go so far, at least through the beginning of season two. AT: Yeah, it’s two steps forward, one step back. And then it’s three steps forward, and one step back. It swings around a bit for Ross. But that’s what’s great about him, too. He’s not beaten by the world. He will always pull himself up by his bootstraps and carry on. He’s unapologetic about his approach to life. He’s a very strong-natured character. His company closed down, he started out the series broke, they lost their child Julia, and their relationship is on the rocks. In the first episode [of the second season], he’s possibly headed for prison. And still, he’s undeniable in the way he approaches things. I think he says to Demelza once, “They can’t send me away, I’ve got too much to do.” He totally believes that. And, again, that can sometimes get him into a lot of trouble. AVC: How have things have changed for you professionally since the show started? Are you getting more offers to do other things? Do you have to go to fewer auditions? AT: I’m just so busy with this job. Poldark takes up over seven months a year for me, and that’s not including press obligations and different things like that. Earlier this year, when I finished shooting, I had four months off before I started series three, which I did a couple of weeks ago. It’s been a long time since I had sort of a sabbatical, or time off work. I got to travel, see friends, catch up with family. Just do things I haven’t done in years and years. It afforded me that time, which was lovely. But this job takes up a lot. I’m in something like 140 of the days that we work on Poldark. I think I’ll get two days off, and those two days are usually packed full of something else that is Poldark-related. I don’t even have time to read other scripts. I’m at home every single night, doing lines after work. Right now, I’m obviously doing some press, but I was shooting all day. I just got in about an hour and a half ago, and before that I was galloping a horse all day around Cornwall. I know, great work if you can get it, but all the same, it takes up a lot of time. The very first year I did quite a lot of work. After season one, I had four, five months off, and I managed to squeeze in a few jobs. One’s called The Secret Scripture, which Jim Sheridan directed, and it premiered at Toronto last night. But just right now it’s Poldark for me. I think until Poldark is completely finished, I won’t get a chance to really involve myself in other things. AVC: And you’re working on season three right now? AT: We’re in week two now. This will keep us going until I believe we wrap this up in mid-March next year. It’s going to be a busy few months. For me, it’s really the greatest job. I love Debbie Horsfield’s adaptions, and I love her writing. I love Winston’s stories, and we just have the best crew. I know it’s cliché to say, and every actor seems to say it in case they get into trouble, but it really is true for this job. We are like a family. We have to be. We basically all live close by when we’re on location, even when we’re in the studio, and we see each other all day every day. So we need to get on and it’s just as well we do. But we have such a talented team behind us, it’s a joy to work in this job. And to explore this character. It’s not like shooting a feature film where you get to explore the character over a couple of hours. We have almost 18 hours of the show so far that we’ve done, and I feel like I’m just getting involved and just getting to know this character. AVC: You’ve spent a lot of time in Cornwall doing the show. Is Cornwall reaping the rewards of Poldark’s success? Are people going to see the mines? AT: I believe so. The very first year we had fans coming out, finding out somehow, and showing up in all sorts of places that are even difficult for our film crew to get to. We’d see some fans at locations before we’d arrive. But this year, there’s a great excitement about the show. I think people in Cornwall are very proud of it. Andrew Graham, Winston Graham’s son, is very proud of the show, and says his dad would have been, too. We can’t really go anywhere without a bunch of fans showing up. But they’re so supportive, and they’re so polite and lovely. They don’t hamper or get in the way of any of the shooting. They’re just there to support us and to tell us we’re doing a great job, which is always lovely. But, yeah, there’s a definite buzz around town. It’s nice to feel that, that we’re doing the show justice.